To discover the "best" Sony digital SLR, you'll have to compare cameras that have a lot of features in common. Sony has branded its digital SLR line "ALPHA", using the lowercase α from the Greek alphabet. The rationale: when you want your cameras to be number one, doesn't it make sense to use the first letter of the alphabet? Joking aside, the term ALPHA is familiar to photographers and Japan and China who have used Konica Minolta cameras - which makes sense, since Sony acquired all of Konica Minolta's digital SLR technology in 2006. After that acquisition, Sony has churned out one camera after the next, constantly improving upon the feature set in each new model released. Sony has pretty good timing. They ramped up their digital SLR presence and partnered with Konica Minolta right before Konica Minolta closed up shop for good. Sony acquired all of Konica Minolta's production know-how, allowing them to develop their first digital SLR in fairly record time. Sony wants to be a big competitor in the digital SLR camera market, and that's exactly the direction they're heading. While exceptional in may ways, digital SLR cameras have one major weakness. If you take pictures using the camera's viewfinder then autofocus is snappy and quick. However, if you take pictures using the LCD (also called "live view") autofocus slows to a crawl. This is because in order for live view to work, a mirror inside the camera must be moved out of the way of the sensor. However, when that mirror is moved, it BLOCKS the camera's sophisticated multi-point autofocus. This same issue affects autofocus performance when capturing videos with a DSLR: you often have to resort to manual focus to keep subjects sharp. Now Sony has a solution to this problem: say hello to the translucent mirror. The translucent mirror reflects some light up to the autofocus system AND it allows some light to pass through onto the sensor. This means that autofocus in live view mode and when taking videos is just as snappy as when you're using the viewfinder. The SLT system also provides some of the fastest continuous shot speeds available on any model DSLR camera — good news if you're a real action photo junkie. In 2006, there was just one Sony digital SLR available: the ALPHA A100. Today, there are many more than that, and Sony has definitely shifted away from "traditional" SLRs to their SLT cameras. QUICK OVERVIEW: 16 megapixels, 7 photos per second, fast live view autofocus, HD 1080i movie mode. Building upon Sony's line of translucent mirror cameras, the SLT-A37 offers a lot of enhanced auto modes to help beginning photographers take better pictures. For example, "Auto Portrait Framing" automatically re-crops any portrait image to improve the composition - a good feature if you have issues taking pictures of people or groups of people. QUICK OVERVIEW: 16.2 megapixels, 12 photos per second, fast live view autofocus, HD 1080i movie mode. Here is the next generation of the SLT-A55. The A57 borrows a lot from its predecessor, including an exceptionally fast shooting speed and an electronic viewfinder. New additions to the SLT-A57 include a better battery, increased ISO range and a mode that optimizes your portrait images. The A57 also has a flexible LCD, making it easy to compose photos and videos from high and low angles. QUICK OVERVIEW: Full frame, 24.3 megapixels, built-in image stabilization, ISO up to 25600, uncompressed Full HD 1080p video. The SLT-A99 is the Sony digital SLR for professionals, which explains why it's so expensive even before you get a lens to go with it. Built into its shell is a full frame 24 megapixel sensor, built-in image stabilization, dual autofocus systems and a Full HD 1080p movie mode. 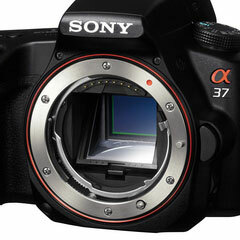 Like Sony's other SLT cameras, the A99 has an electronic viewfinder instead of an optical one. You can also leverage the flexible 3 inch LCD screen to compose images at odd angles. QUICK OVERVIEW: 24.3 megapixels, built-in image stabilization, ISO up to 16000, Full HD 1080p video, electronic OLED viewfinder. The A65 has a little bit of everything included. It can capture action shots, leveraging its 15-point autofocus and top speed of 10 photos per second. It can capture landscapes with an auto panorama mode and High Dynamic Range (HDR) setting. Finally, it's good for portraits since you can use the flexible LCD to compose photos while maintaining eye contact with your subjects. Since Sony is a relatively new player in the digital SLR camera market, they have released a LOT of camera models in a very short period of time. As such, Sony digital SLR cameras tend to become out-of-date much sooner than cameras from other established companies like Canon and Nikon. September 2010 If you really want to push the speed envelope, then consider the SLT-A55 instead of the SLT-A33. The A55 can capture consecutive photos as a whopping 10 per second, and can also capture HD 1080i video. It also has a flexible 3 inch LCD screen, fast 15-point autofocus, sweep panorama and auto HDR (all features shared with the A33). September 2010 While the SLT-A33 is not a "true" digital SLR, I've included it here because it shares so many features with DSLRs. The SLT-A33 has an electronic viewfinder (which disqualifies it from the SLR name). It also has a semi-transparent mirror, which helps it have very fast autofocus during live view and video capture and give it the super-fast continuous speed of 7 photos per second. A sweep panorama and auto HDR (High Dynamic Range) mode assist with creative images. July 2010 For a little more than the basic A290, you get live view (with Sony's fast autofocus system) and a 2.7 inch LCD that tilts out from the camera for high and low-angle photos. The A390 is for still shots, since it does not include a movie mode. July 2010 If you're looking for a basic Sony digital SLR, then the A290 is a good bet. It has a fixed LCD screen and NO video capture mode which keeps the price down and makes this camera less intimidating to those just making the switch from a point-and-shoot compact. July 2009 The main difference between the A330 and A380 is the step up in megapixels (from 12 to 14). On all other features, these cameras are virtually identical — if you don't want to make large prints then go for the lower megapixel count on the A330. July 2009 The A330 is one of Sony's basic digital SLR cameras - and it is also economical. The live view LCD screen can be flipped out from the camera body, making high and low-angle shots significantly easier. Oct. 2008 The A900 is Sony's first foray into the pro-DSLR market. The A900 includes a lot of high-end features but the standout is its full-frame sensor: it captures a whopping 24.6 megapixels in every shot. The real surprise here is that it's able to capture images at a continuous rate of 5 photos per second (despite their enormous size).